The rebooted Rogue Trooper’s first story, The War Machine, finishes this prog with us learning that the planet originally called Nu Earth is now the real Earth for the re-launch. The story ends with Friday wandering away from a crashed shuttle from Highside (formally known as Millicom) declaring internally his one man intention to end the war there. Personally, I think the original objective of hunting down the Traitor General makes a lot more sense. Appearing in short run chunks hasn’t helped the story, but The War Machine felt to me like a remix of the original tales done for movie folk. Little was added and more has been taken away. The landscape has been awash with Will Simpson’s paint work but the stories drawn originally by Gibbons, Ewins, Wilson and Kennedy had a greater sense of chemical sickness. Meanwhile, another story that’s suffered from fitful appearances, Strontium Dog The Final Solution, ends with the death of Johnny Alpha. Unlike Simon Pegg’s character in the sitcom Spaced, I didn’t find Alpha’s fate particularly moving. Tharg compromised any remaining impact it might have had by reminding us for the last eighteen months in the Nerve Centre that a major character was due to snuff it. We all worked out that it was Alpha long ago. 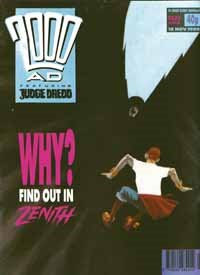 Judge Dredd Necropolis reaches part twelve this prog. 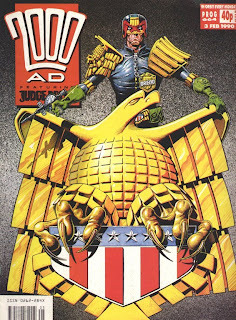 Let’s not forget however that prior to its start, there was the five part Count Down to Necropolis which means it’s been four months since the real Judge Dredd has appeared in 2000 AD. If you include The Tale of the Dead Man story directly before that, then it’s been nearly six months since we learned that the Dead Man is Judge Dredd. It’s a wonder we Squazz Dek Thargo didn’t go crazy with frustration at the start of 1990. Necropolis has had a beautifully paced and extremely creepy build up to this point. When the Dead Man eventually appears driving his jeep over the horizon it’s a wonderfully liberating moment. When the crazy, bearded lady that attacks Dredd and the lumpy mutant with him is revealed to be ex-Chief Judge McGruder the relief is almost tangible. 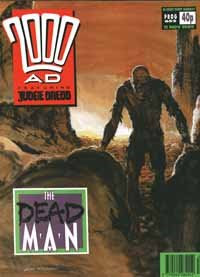 I’m imagining everybody involved believing Necropolis to be John Wagner’s final Judge Dredd story. He certainly seems to be throwing the unthinkable at us throughout it. Yet, despite knowing that ultimately the status quo will be returned, I find myself buying into events like some idiot juve. 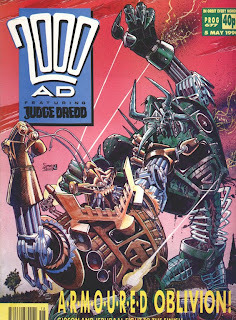 The most amazing thing about this epic is that Carlos Ezquerra has painted an average of seven pages of art per episode for the last seventeen progs. My God, man; you’re making Will Simpson and Simon Bisley look like doddering old geezers! This prog might be a small scale re-launch issue featuring the return of Rogue Trooper The War Machine (for how long this time?) and The Harlem Heroes (oh Christ) but I can’t help but mention the latest 2000 AD spin off comic, Revolver, advertised in the back. In case you don’t recall, Revolver was a monthly comic that featured a number of strips, none of which were meant to be thought of as the lead. All of the strips were to have a finite run where upon they would be collected into an album and replaced in the comic by something else. Anyway, Revolver only lasted for seven issues. Some memorable stuff appeared in there though. 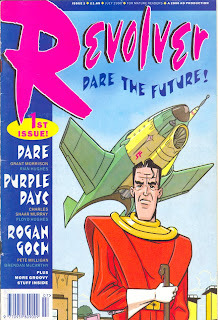 Most notably, Grant Morrison and Rian Hughes’ grown up spin on Dan Dare (has an artist been meant to draw Dare more than Hughes. He even looks like him, for God’s sake) and the curry fuelled, hallucinogenic trip, Rogan Gosh, by Pete Milligan and Brendan McCarthy. Unfortunately, a lot of plodding stuff featured there also, the Jimi Hendrix strip by Charles Shaar Murray and Floyd Hughes springs to mind. By definition, not featuring a regular lead, Revolver was entering a risky area. 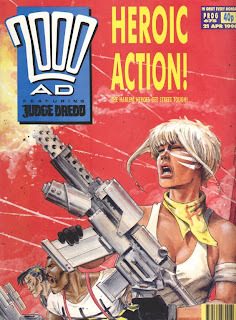 However, I feel that its quick cancellation was also down to its overt association with 2000 AD and Crisis. 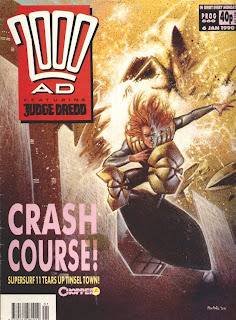 As The Slog has established, 2000 AD’s content is far from consistent at this time whilst Crisis was resisting giving itself fully to the fresher breed of creators by jettisoning Third World War as it should have. I think that much of the market Revolver was built to tap into was already fatigued by the watering down of quality thanks in part to the expansion of the line and wasn’t willing to take a gamble on this brand new publication featuring no notable lead or tone to bind it together. Which might be why the themed spin-offs from Revolver (yes, there were four) such as the Romance and Horror Specials were great. If only the monthly had been more like these. ITEM: The second Universal Soldier story, which has no title or marker that identifies it as separate to the previous tale, sees Max Brewster use his experience and brain chip to train a village to defend itself from attack by both a ravaging clan and a bunch of renegades. The artist is Simon Colby whose style is engaging and, on the surface, inoffensive. Colby has a stylistic quirk that warps the image slightly and flattens the scene. It’s as if he’s drawn it on a wonky desk rather than on upright drawing board. Also, all of the male characters have the same over-muscled physique. It means that they look alike and all that separates them from each other are things like moustaches, hair styles and scars. You can see how when this Universal Soldier story immediately followed Harlem Heroes it seemed to punctuate its meatheadedness. Kid Bambos’ lettering looks too big too as if the original artwork was drawn to actual reproduction size rather than reduction. It makes me wonder if this is one of Colby’s earliest gigs and once he’s been given a few more of the professionals’ tips he will get closer to fulfilling his promise. ITEM: In light of the recent reinvention of The Harlem Heroes, I am beginning to think that perhaps I have been a little harsh on writer Hilary Robinson. In fact, her first Chronos Carnival adventure has read like an appreciated palate cleanser after all of that male posing and forced hostility that came before it. Of course, it’s been helped by the absolute brilliance of Ron Smith’s perfectly rendered artwork. My only criticism is that the male lead’s wheelchair seems ordinary and doesn’t feature spikes on the wheels or carry machines guns and chair to air missiles. Hilary missed a trick there. There’s been a lot of short term strips popping up recently including Chronos Carnival and The Universal Soldier. From an editorial point of view, I can see how these might be preferable at this time given the increased colour content, the expansion of the line and the amount of work this all requires. The best of these thrills recently has been Shadows by Peter Milligan and Richard Elson which, this prog, reaches part eight of its run. Shadows is like The Net movie starring Sandra Bullock except from five years earlier and much better (probably. I’ve never seen The Net, actually). In it, Nina Coltrane, whilst surfing “The Zone” for information gets too close to uncovering a secret project called “Falls The Shadow” and, as a result, is dropped as if she never existed. Consequently, her boyfriend and mother have been mysteriously killed and she is now a “Shadow” (or a tramp) who has teamed up with the frustratingly enigmatic Hood to uncover the reason for her excommunication. In comparison with other thrills, Shadows seems wordy but this is perfectly acceptable when these words are written by Pete Milligan. Although by no means a glitzy and glamorous artist, Elson seems focused on telling the story which, given the conceptual landscapes he’s been asked to represent, is an admirable achievement. The most entertaining thing about Shadows however is seeing with the benefit of hindsight what is essentially the internet being represented in such a way only a few years before it becomes widely used. If Harlem Heroes is thick then Armoured Gideon is crazy. Newspaper photographer Frank Weitz has stumbled across a giant robot whose purpose it seems is to keep a dimension of demons called “The Edge” in check. This involves Gideon spraying holy water from tubes, shouting “Annihilate” and causing general mayhem as Frank runs around, falling through gateways in space and trying to avoid being crushed altogether. It all gets even more crazy when Gideon’s brother Jerubaal appears and they have a giant robot fight in the countryside. When you contrast it against the insulting Harlem Heroes there’s a lot to like about Armoured Gideon. John Tomlinson’s dialogue is enjoyable even if the story itself leaves me feeling as if I’ve been the only adult in charge of a party for four years olds; I think that might have been fun but right now I feel bewildered and have a headache. Simon Jacob’s artwork is quirky, at times intricate, expressive and original. Steve Potter’s lettering (I don’t mention the lettering often enough at The Slog) adds the cherry to the strip’s design cake. Visually, it all hangs together well. Whether I actually like Armoured Gideon or not, I can’t say for sure. Hopefully, I’ll be able to make better sense of it later and be able to tell you what I think then. The reinvention of Harlem Heroes by Michael Fleisher, Steve Dillon and Kevin Walker is up to part five this prog and I have to say, I didn’t like it then and I don’t like it now. The original incarnation of The Harlem Heroes by Pat Mills and Dave Gibbons apart from all the lead characters being black was about team loyalty, pride in where you come from, good sportsmanship and respect for the opposition balanced against healthy competitiveness, all under a sheen of good old fashioned comic book violence. The new Harlem Heroes seems to be about a bunch of meatheads running around and blowin’ fings up. The art is by the same team who drew one of the most enjoyable Rogue Trooper stories of recent years, Cinebar. Their work there looked exciting and dynamic; here, although solid, it looks static and plodding. To be fair, it might be that the I find the story and characters so un-engaging that it’s me who is interpreting the art this way and, actually, it might be as good as it was before. Michael Fleisher is definitely a controversial choice for a 2000 AD script writer. Years before, he had gained a strong reputation amongst comic fans for his work on Jonah Hex (never read it) published by DC Comics. More recently, he wrote a limited series for them called Haywire which I did read and remember quite liking. At this time, editors at 2000 AD were vocal about their irritation at discovering the creator talent only for them to bugger off to America. So I imagine that at a time when the line is expanding and new contributors are required the current Tharg probably saw stealing at least one of America’s creators back amusing. On the surface, hiring Fleisher probably seemed like a good idea. My recollection is that his pacing on Haywire was similar to that used in the scripting tone at 2000 AD. However, although he observed 2000 AD’s unsentimental and violent story content he never seemed to pick up on the satire, wit, intelligence and investment of ideas that the best of them also contained. This is why the new Harlem Heroes is populated by charmless meatheads. The big white guy with the guns? He’s a meathead. The moody black guy who leads the team? He’s a meathead. The guy who is good with computers? Unfortunately, he’s a meathead too. Even the woman; she’s a meathead. The bloke who runs the prison from which they escape? Meathead. The bloke who tells them that they have to now run around killing drug dealers? Meathead. The drug dealers? Meatheads. Absolutely everyone is a meathead… except for the accountant character. He’s a weasel. ITEM: Rogue Trooper has buggered of again after only five more episodes to be replaced, unexpectedly, by the return of Universal Soldier. Fortunately, this new story isn’t being drawn by Will Simpson this time. So far, Friday (that’s Rogue’s name now) has smuggled himself aboard an aircraft heading for Highside as, internally, his dialogue continues to occur in bits. Even William Shatner’s speech in his spoken word cover versions arrive less fitfully than Friday’s internally musings. ITEM: The reboot of Harlem Heroes by Michael Fleisher, Steve Dillon and Kevin Walker started last prog. I feel that, in the interests of balance, it’s a little too early to comment on fairly although it does seem as if everyone involved has wasted no time in making it as awful as possible. 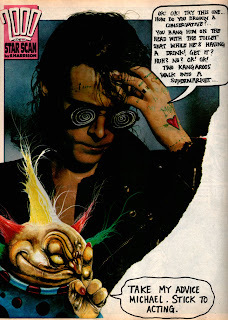 I am interested to know how this reboot came about when, according to my understanding, Pat Mills has always been resistant to allowing strips that he’s created being written by anyone else. Is it fair to assume this has been done either with his permission or without his consultation altogether? 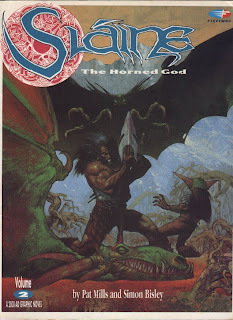 On the back of this prog is an ad for the Slaine the Horned God Volume Two graphic novel. That was quick! It only finished a couple of weeks ago! The repackaging of 2000 AD material in album form seems to be shifting from the originators, Titan Books, to in house at Fleetway. Already they’ve made a start on the Mills/Bisley Slaine story with New Statesmen from Crisis being serialised in the US prestige format for the specialist comic market. Around the corner there’s Chopper Song of the Surfer and Rogue Trooper The War Machine once Will Simpson gets that finished for the weekly first. I really liked these Fleetway collections even if I currently own very few of them. There was a fresh smell when you opened them up that never seemed to go away and a glossy quality to the paper that elevated the artwork considerably. However, I did usually hesitate at opening the books too fully in case the glue snapped and the pages fluttered away plus a crease in the cover stock often added over a decade to the book’s age. It’s a bit puzzling to me what the reprint arrangements were at this time. Fleetway might have been publishing Bisley’s Slaine but it was Titan Books who brought out, for example, The Dead Man collection and Zenith Phase III (over a couple of volumes, those sly ol’ dogs). My guess is that Fleetway did the colour albums and left Titan with the black and white work. This is how irritated I am by the tedious in-joke that Bradley’s journey through late eighties rock and pop is; I am actually quite pleased to see Zippy Couriers back. At least Hilary Robinson and Graham Higgins provide it with some sense of craft and professionalism rather than it feeling like it was composed in the pub on a Sunday afternoon. It’s not their fault that it’s presence in 2000 AD isn’t entirely suitable, is it. My favourite new strip’s first story comes to an end this prog; Bix Barton Master of the Rum and Uncanny. This is Peter Milligan and Jim McCarthy’s satire of and tribute to Marvel Comics Doctor Strange. The main villain is even called Steve Ditto after Doctor Strange artist and creator Steve Ditko. In the story, the government are about to pull the funding of Bix’s Department of the Irrational when mysterious cases of monsterism occur in an English village. Bix and his trusty walking stick, Michael Kane, are soon on the case. There’s much to enjoy about Bix Barton from the character’s constant use of Rugby analogies to the upbeat dynamic between him and his ridiculous yet dignified side kick, Michael. Any Squaxx dek Thargo undecided about writer Milligan before now must be won over by his sense of fun here whilst McCarthy’s artwork gives the strip a classic and almost iconic feel. Whilst re-encountering Bix Barton for The Slog I was very much reminded of The Mighty Boosh. The characterisation and the surreal humour seem very similar to each other although, obviously, Bix predates The Mighty Boosh by at least a decade. Bix Barton even has its own grotesque male local called The Poacher who takes a shine to him and wants him to be his bride, just like the character Kodiac Jack did to Vince in The Mighty Boosh episode The Call of the Yeti. As regular readers of The Slog will know, I’m not a fan of Bradley, the bland little “sprog” who, at this time, pops up in short story runs every now and then. However, the current sequence of tales in which he and his ugly little friends travel through time to encounter late nineteen eighties British rock and pop acts for the benefit of his “Grandpappy” are rubbish beyond belief. 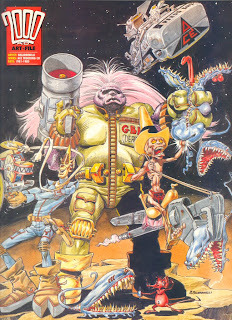 There seems to be a tiny but influential group of staff at 2000 AD, which includes the current Tharg and writer Alan Mckenzie, who seem to think that the comic benefits from constant over laboured references to recent bands and pop trends. In this prog, Bradley and his friends meet The Sisters of Mercy in a four paged story that is neither witty nor well observed and barely qualifies as a story. Simon Harrison’s fully painted artwork does look good but would look a whole lot better if he hadn’t had written his own criticisms across it like a teenage school girl writing “I luv Jason 4 ever” across the front of a school exercise book. 2000 AD was born at the same time punk was and got the balance right between acknowledging its existence and not being condescending to it. Since rave happened a couple of years before, the comic has patronised it like a recently divorced dad trying to recapture what he thinks of as his missed youth. It’s embarrassing for us all. Meanwhile, in this prog’s Nerve Centre, as if to confirm my point about the inappropriateness of all this rock and pop referencing, Brian and Alan Taylor write, “It is with great sadness that we must inform you that you are no longer our sole source of Thrill-Power. For we have rediscovered the one and only, thrill-throbbin’ Leader of the Gang… Gary Glitter. Gary can make us jump out of bed standing on his head, any time.” I bet he can. Tharg replies, “What courage. What resolve. Imagine having the guts to stand up in public and admit to having been at the Gary Glitter Gangshow.” Personally, I’m still reeling from the revelation that that was never Gary Glitter’s real hair. 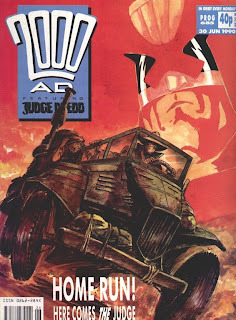 Thanks to the unofficial thrill cross over event between The Dead Man, Judge Dredd and, to a lesser extent (or, more accurately, no extent but it is also written by John Wagner) Chopper, Slaine The Horned God has slipped slightly on my radar. Wagner seems to do this; every time something eventful happens elsewhere in the comic he ups his game in unexpected and satisfying ways. Volume Two of The Horned God wraps up this prog with The Drune Lords, The Sea Demons and The Tribes of the Earth Goddess all marching into battle against each other. Every creator has maintained their form here. I’m particularly impressed by Simon Bisley who paints stunning artwork at a rate that must make other artists gag with jealousy. If anything, his work has improved this time thanks to a lack of those shortcut pages I spotted in volume one. Over in Judge Dredd, the appraisal of rookie Judge Kraken continues with art by Will Simpson. Correct me if I’m wrong, but shouldn’t he be working on Rogue Trooper War Machine of which we’ve only seen four episodes so far. Okay, I know that this work was probably done before he started on the new Rogue but it only goes to increase my confusion over why Tharg decided to run it when so little of it was completed. More shocking than learning that Kevin Spacey was putting on that limp in The Usual Suspects and more surprising than learning that Bruce Willis had been a ghost all along in The Sixth Sense is the revelation that The Dead Man’s true identity is Judge Dredd. First time around I had to stand up so I could sit down again because of the shock. Even this time, twenty years later, my pulse rate increased and I got a little breathless. By the time The Dead Man concludes this prog we learn that the dark judges are returning with two damn ugly sisters in tow and that Dredd has taken the long walk. 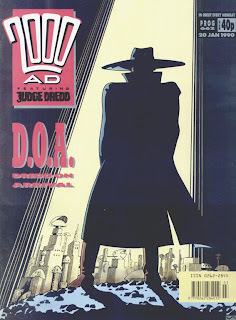 Someone should tell the lead strip because he’s still a judge in Mega City One there. 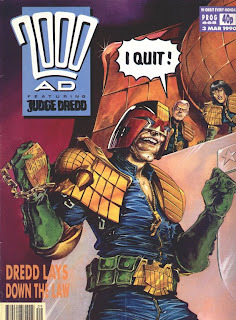 Oh, someone has, because no sooner does The Dead Man finish than he turns up in Judge Dredd reminiscing about the circumstances that led to his retirement from duty and taking the long walk. I love The Dead Man. I love the focused writing and the professional artwork. I love the dynamic between the main character and Yassa, the young boy who tells the story. I love the creeping atmosphere, the sense that something really bad is about to happen. I love the reveal and the fact that it couldn’t have been nearly as affective had The Dead Man appeared anywhere other than in an anthology alongside the strip it is referencing. I love seeing the rule of never seeing Dredd’s face being broken even if it is all scared up and not normally how he would look. I love the way the two strips come together this prog and the plot is passed from one to the other. I didn’t love seeing Yassa getting his eyes burned out. I really like that kid. Thanks to Chopper Song of the Surfer, I find myself wondering how many Supersurf stories there is to tell. Personally, I think that all you need is the first, The Midnight Surfer, and that all subsequent tales lack something of the original. This isn’t to say that Song of the Surfer isn’t worthwhile. In fact, this is John Wagner on form, even if he is going over some old ground to get there. In Song of the Surfer, Chopper and Jug have gone to Mega City Two to enter Supersurf 11. This time the race’s sponsor has decided to make it more interesting by lining the route with snipers and other offensive traps. Worryingly, Chopper’s death in the race has been foretold by his late friend from the Outback, Smokie. The strip occupies one of the comic’s three available colour slots. It looks to me like the early episodes were drawn by Colin MacNeil for black and white reproduction and coloured later by someone else. Now, however, it’s being fully painted by the artist. MacNeil is doing a great job here. His work looks vibrant even if it doesn’t quite have the same sense of kinetic movement that previous hover board races by other artists have had. There is also a bleaker tone to the story. There is a sad disregard for life from the sponsors and fans of the sport. Deaths in Supersurf that occurred before were unfortunate side effects of the race but now it’s a requirement. Wagner is satirising the sadistic aspect to the relationship between the public and those in the public eye here perhaps foreseeing TV shows like I’m a Celebrity. Of course, he has slaughtered millions of people in his stories before, but in Song of the Surfer we are familiar with the characters that now seem more trapped than previously and even more exposed to the exhausting violence. There is a sense that Chopper has outgrown the adolescent frustrations that motivated him in previous races and is acting immaturely and selfishly by taking part in Supersurf 11. Basically, Marlon has now changed and, consequently, might be less appealing because of it. Two classic art robots come in from the cold this prog, I mean, return from their gigs at Crisis. Carlos Ezquerra draws in colour a three part Anderson PSI Division story called The Random Man while Slaine The Horned God Book Two is on a break. It’s surprising what a difference the artist can make to my enjoyment of a character. 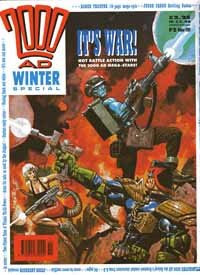 This prog’s Judge Dredd story, Little Spuggy’s Christmas, is by Jim Bakie. Obviously, Dredd has been drawn by many artists over the years, but I think of Bakie as one of the better ones. He seems to have a particular insight into the character’s physicality that other artists lack. John Ridgeway, another old school artist, demonstrates again his inclination for a good Cursed Earth adventure in The Dead Man. I don’t know if you remember The Raggedy Man which he drew? Well, that was set in the Cursed Earth. In fact, another Dredd tale by him, Twister, is also set there… partially. (The other part is set in The Land of Oz.) Ridgeway draws a strong creepy, arid environment, I think. This prog’s notable first is Tyranny Rex painted by Steve Sampson. I have to declare my interest here as at this time Steve was a close acquaintance of mine. About a year before this, Steve drew a strip that I wrote which we never got around to publishing. I still have the original artwork to it somewhere, along with a page from Brit Cit Babes he gave me. He was the first person I knew who made the break into professional comics. So, although I haven’t seen him for years, I don’t feel able to comment on his work with the same high standards of impartiality that you’ve come to expect from The Slog. I am certain, though, that every now and then I will drop his name into conversation in the hope that it might impress someone. 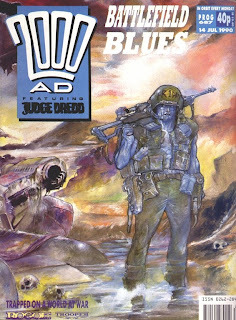 This prog’s notable last is the original Rogue Trooper in the sixteen paged The Hit Conclusion. The art by Chris Weston is fine but Steve Dillon, on script duties here, has delivered a dissatisfying wrap up. It has no real sense of pace or drama. Instead it reads like its being recounted by an over enthusiastic ten year old. “The blue soldier shoots all of the men. Then he gets kicked in the face by the lady assassin. Then she tells him that the aliens have been manipulating him all along.” It’s not really Dillon’s fault. He was tasked with tying up a saga by Tharg which, let’s face it, was so directionless that he would have dropped mid story if he thought the Squaxx dek Thargo would let him get away with it. Dillon does, however, provided an appropriate fate for the bio-chip buddies, all of whom get re-gened as innocent blue babies with Mohican haircuts. Ah, bless. 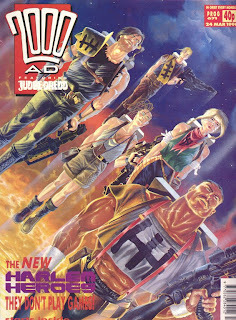 It’s good to see that during this old school revival 2000 AD is currently going through, where writers John Wagner and Pat Mills seem to be returning to and even surpassing previous form, there is still space for the best of the new wave. In Zenith Phase III by Grant Morrison and Steve Yeowell, another Maximan has assembled together hundreds of heroes from various worlds to fight against the pan-dimensional creatures that have already taken over realities 666 and 257 and now threaten the whole of the multi-verse. There’s nothing like a team-up of your favourite superheroes so, considering that I hardly know any of these characters, some of whom appeared in old comics published by Fleetway and the rest being disguised versions of other company properties, it’s impressive that I find this story as engaging as I do. It feels like a lo-fi and more soulful UK based version of Crisis on Infinite Earths where all the various versions of DC characters up until that point had a big final team-up (until the next time) before the publishers consolidated together their worlds and re-launched them (sort of). With Judge Dredd seemingly about to be replaced by his younger clone brother and both Rogue Trooper and Harlem Heroes going through the reboot process, Zenith Phase III feels as if its influence is leaking out of the confines of its five pages a week. Morrison’s skill for releasing the story in a deceptively casual way is on display here. Every line of dialogue, every action says something informative about the characters or the unfolding tale. Meanwhile, the hundreds of heroes Yeowell has had to draw all seem to have their own physical personalities. Some look like people you might know, others walk around in costumes that don’t quite fit while the bad guys do radiate genuine menace. It must be frustrating for those of you who have never read Zenith before hearing how great it is to know that the creators are unwilling to allow any of the books to come back into print. I do wonder, however, if Morrison and/or Yeowell softened their position there would still be issues regarding reprinting Phase III anyway given that some of the characters that appear in it now seem to be owned by DC Comics or Rebellion. I’ve already expressed a slight bewilderment at starting the new Rogue Trooper before the old one has been buried and now, after only four episodes, the strip is going on a ten week break to allow artist Will Simpson “time to catch up”. What was Tharg thinking starting it so soon? So far, it’s taken twenty two pages for Friday (the old Rogue Trooper) to be given a helmet by the dying Top (the old Helm) and a rifle by the dying Eight-Ball (the old Gunner). In the original story by Gerry Finley-Day and Dave Gibbons, it took them only four pages to get this far. Tharg really doesn’t seem to be paying attention this prog. There’s a half page ad for prog 650 inside. Promotion for upcoming issues isn’t uncommon but prog 650 came and went three weeks ago. 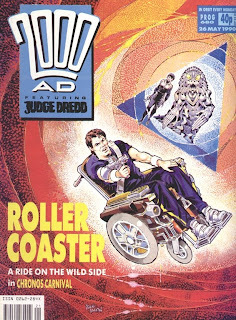 Ads booked for upcoming issues include prog 57, Dice Man issue one and a penny-farthing bicycle. Finally, if you thought that all signs of fun had been drained away from Tharg’s Nerve Centre in preference for debates over what’s better, thrash or grindcore, then look again as my favourite peace of reader’s art ever appears. 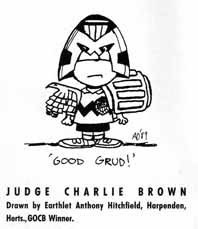 Earthlet Anthony Hitchfield has drawn a picture of Judge Charlie Brown and titled it “Good Grud!” Bravo. 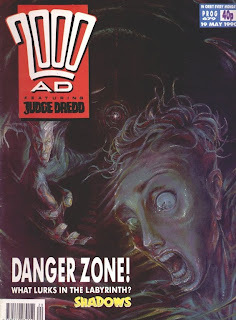 We might be in the midst of the best Slaine and Zenith stories so far but I currently find myself enjoying especially John Wagner’s writing on The Dead Man and Judge Dredd. Why isn’t his work overall more widely regarded than it is? In Young Giant, we learn that the late Judge Giant had an off duty affair and fathered a son. Cadet Giant despite his years of training at The Academy of Law is seething with barely concealed rage over the murder of his mother during the Apocalypse War and it’s down to Dredd to resolve the issue somehow out on patrol. Only two episodes in and I find myself completely gripped by the story which goes to show what a great comic strip making team Wagner and artist Carlos Ezquerra make. The Dead Man is three episodes old and despite knowing this time that the character is revealed to be (spoiler alert!) Judge Dredd himself I’m enjoying it just the same. This prog, the townsfolk gather to share their observations as to who he might be. He has bullet scars, is aged between 45 to 55 and there’s something unnatural about his eyes. How from this I didn’t work out that he is Dredd I’m not sure. I think that perhaps I was second guessing the writer and believed that, ultimately, we would never see Dredd without his helmet even if his face is all scared up. The prog ends with the house ad, “Next prog, more of the same”. This is probably the only time that this ad’s appearance is reassuring rather than being completely irritating which it normally is.